38 Fun items to find during a Thanksgiving Scavenger Hunt. 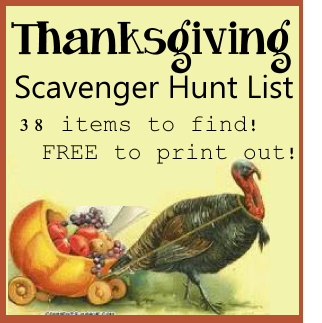 Scavenger hunts are a fun Thanksgiving game for family, birthday and classroom parties. 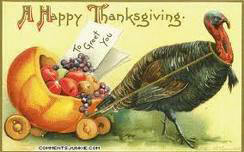 Print out a Thanksgiving Scavenger Hunt List of items to find for each team. If you are dividing into two groups assign one group odd number houses and the other group even number houses. Set a time limit - usually 1 - 2 hours - and the first team back gets 10 bonus points. Give each item a value, or make them all worth 5 points. You can also give extra points for creativity such as bringing back Indian corn, candy corn and corn in a can for Corn. Adults should always go with children when they are collecting items in a neighborhood. For more Scavenger Hunt Lists that are free to print out see our Scavenger Hunt page.